Now the horror reaches new heights with Widow’s Walk—the first-ever expansion for the critically acclaimed board game Betrayal at House on the Hill. The house is expanded with the addition of 20 new rooms, including the roof, a previously unexplored floor. Also in its halls you will find new monsters, items, omens, events, and 50 brand-new haunts, penned by an all-star cast of contributors from the world of gaming and entertainment. In Widow’s Walk, terror and panic are taken to a whole new level. If you read my review on the core game then you know how much I love Betrayal at House on the Hill. Widow’s Walk, basically, doubles the outcomes of the game and enhances the overall core game. You get a whole other floor to explore, new items, new omens, and new events. My one gripe would be, I would have liked a few more characters to add to the list. While it’s not that big of a deal I like having options. If you loved Betrayal, get Widow’s Walk! Everyone who enjoys horror should have this in their collection! 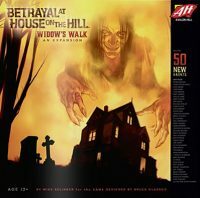 Add a Review for "Betrayal at House on the Hill: Widow’s Walk"